You may receive updates from Susannah Cunningham, the creator of this petition. Many of us have had the pleasure of working with, studying under, and/or being helped by Barbara Harrell-Bond. 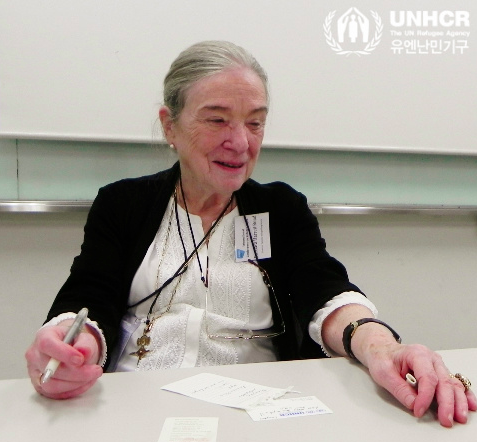 As a seminal and dedicated advocate for refugee rights over the last several decades, Barbara has had a uniquely remarkable impact, both in the field of Forced Migration and as a pioneering practitioner in the field of refugee legal rights advocacy. As those who have witnessed first-hand Barbara's remarkable advocacy on behalf of refugee rights, we would like to nominate her for the UNHCR International Nansen Refugee Advocate Award. Nominations are due Feb 8, 2018. About the award: "The UNHCR Nansen Refugee Award is presented every year to an individual or organisation who has dedicated their time going above and beyond the call of duty to help people forcibly displaced from their homes...Through its recipients, the Nansen Refugee Award aims to showcase Nansen’s values of perseverance and commitment in the face of adversity." In this moment--with charged and pervasive political assaults on refugee programs globally--we are reminded of the value of advocates and heroes like Barbara who have long fought for fair treatment of refugees, ever more so for a nominee who is both American and British at a time when we see the U.S. and the UK recoiling from support of refugees. Please sign the petition if you support Barbara's nomination. We will share this list of supporters with the Nansen Award board, along with providing petition co-signers a streamlined way to support Barbara's nomination for the Nansen Award. As those who have witnessed first-hand Barbara Harrell-Bond's remarkable advocacy on behalf of refugees globally, we would like to nominate her for the UNHCR International Nansen Refugee Advocate Award. Nominations are due Feb 8, 2018. For her tireless efforts on behalf of refugees globally, we nominate Barbara Harrell-Bond for the Nansen Refugee Advocate Award in 2018.